Mesmerizingly medieval in appearance, Roccalbegna, once owned by the Aldobrandeschi family and later the Siena Republic, is a town that looks like something straight out of a fantasy novel. A daring stronghold perched on a sort of huge massif looms over a handful of houses that make up the town. The lack of proportion between village and rock is reminiscent of the ancient presence of a dragon and the treasure over which the beast stands guard. Aside from the stronghold, the town’s most famous monument is the striking Church of Santi Pietro e Paolo, in the central piazza, also home to the town hall and the tiny but beautiful Civic Tower (with a lovely clock). The local terrain, notoriously unstable, frequently causes small’scale landslides and landfall, as seen in the church, whose door lintel became visibly slanted after one of these movement, giving the building a uniquely lopsided look. Inside you can see important frescoes and painting, such as the altar piece, a Madonna and Child painted in 1340 by Ambrogio Lorenzetti. Behind the church stands the Oratory of the Crucifix, now a museum. Francesco Nasini and Sebastiano Folli are the most represented authors. Check out the lovely cross by Luca di Tommè, a Sienese artist who created it in about 1360. Outside of the Porta di Maremma, the little Church della Madonna completes the town’s monuments, with frescoes from the 15th century. Behind the church, the panoramic open space of the stronghold is worth a visit. 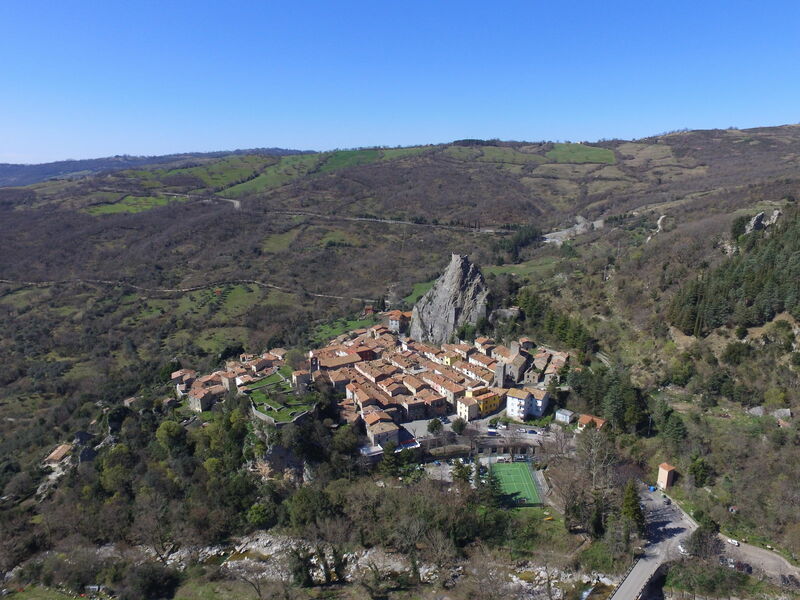 But the destination not to be missed, the most famous in Roccalbegna, is the Pietra, the keep that dominates the town, reached by a steep road and then up the narrow stone steps that cling to the rock. Roccalbegna’s surroundings are also worth exploring. Cana maintains some of its medieval appearance and hosts a beautiful cistern from the Medici era. In Vallerona, just before the hamlet, head for the Church of St. Pio I and a neoclassical fountain. Nature lovers can venture south along the rough track next to the river Albegna. The first section, roughly 3 kilometers, can be done by car or mountain bike, then you’ll need to continue on foot along the exposed gravel river bed. Poplars and willows take the place of oaks and broom, and you don’t have to try too hard to see numerous species of birds such as the blackbird and kingfisher. The WWF Oasis of Bosco Rocconi faces onto the river, home to rare birds of prey like the harrier eagle, the hobby, the sparrow-hawk and the lanner. Slightly east of Roccalbegna is Triana, an imposing castle that passed from the Aldobrandeschi to the Piccolomini of Siena in 1388, formed of two imposing buildings and an impressive keep that is mostly covered in ivy. Last but not least, munch on the famous savory cookies of Roccalbegna, a delight with a touch of aniseed that you’ll only find here.